At the Incremental Backup step of the wizard, choose a media pool that will be used for archiving incremental backups of the selected files and create a schedule for incremental file backups. From the Media pool for incremental backup list, choose a media pool that will be used for incremental file backups. To schedule periodic creation of incremental file backups, select the Run incremental backup automatically check box and specify the schedule according to which the job will create incremental file backups. 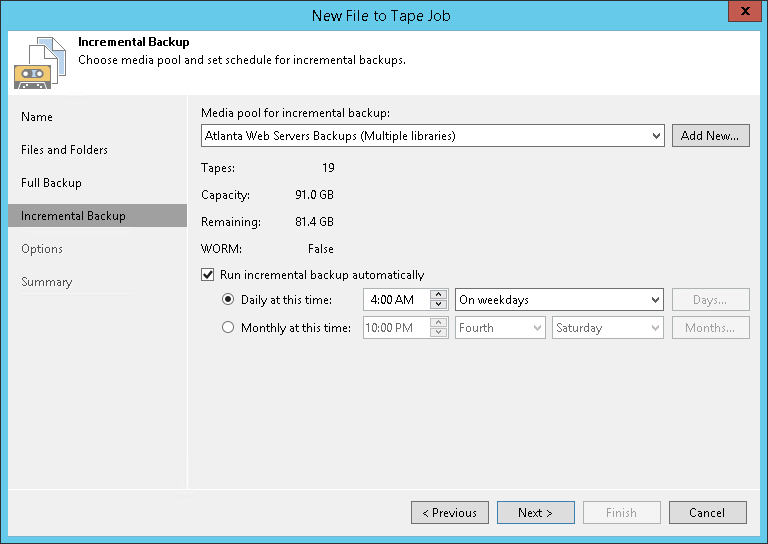 If this option is disabled, you will need to start the job manually to create incremental backups of files. If you have not previously created a media pool with the required settings, you can click the Add New button and create a new media pool without closing the job wizard. For more details, see Creating Media Pools.